Drug development in diabetes and obesity is a rapidly changing research field. 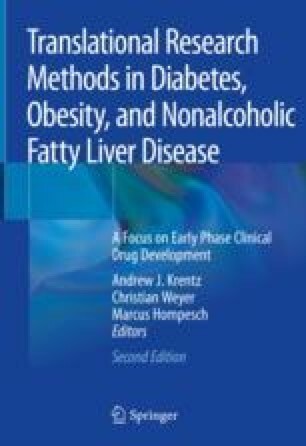 Although the diabetes and obesity disease cluster is currently dominated by therapeutics indicated for diabetes, many anti-obesity compounds are in various stages of development and target several promising mechanisms involved in body weight regulation, particularly those linked to central appetite function. In addition, there is a considerable focus on advancing drug treatment concepts in disease-related liver complications, notably nonalcoholic steatohepatitis (NASH). Animal models of diabetes and obesity play a pivotal role in the exploration of the underlying disease mechanisms and have proven to be highly instrumental in preclinical target discovery and drug development. Most of the current disease mechanistic knowledge has arisen from research employing mouse and rat models that mimic the human condition in varying degree. The disease models are based on various experimental manipulations, including dietary concepts, genetic modifications, chemotoxins and surgical approaches. The rodent models employed in preclinical drug development for type 2 diabetes and obesity exhibit both distinct and overlapping pathology. Due to their individual clinical and histopathological phenotype, diabetes and obesity models also differ with respect to clinical translatability which has important implications for their applicability in preclinical drug development. With the aim to guide researchers in the selection of appropriate rodent models for testing drug candidates in preclinical development for diabetes and obesity, we here evaluate the most prevalent rodent models employed in type 2 diabetes and obesity research. In addition, we review current rodent models applicable for probing effects of therapeutic drug concepts in NASH. World Health Organization. Obesity and overweight Fact sheet. https://www.who.int/news-room/fact-sheets/detail/obesity-and-overweight. 2017.